Thank you for your feedback. All of our special promotional packages are sponsored by the resorts and the reason why the rooms are up to 80% discounted from the retail rate is because the resort is subsidizing the room in exchange for your time during the resort preview. Each customer must meet the terms & conditions which is set forth by the resort and we go over with customer. We do not set forth the terms & conditions and the income you told us for the promotion was different than what you told the resort during their welcome call which why you did not qualify for the special promotional rate. Additionally, you have received a 100% refund with no penalty. 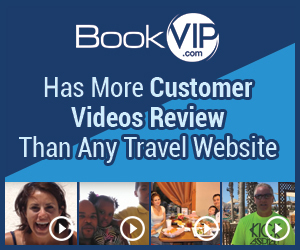 I pride myself in BookVip offering the most discounted vacation packages and having an A+ rating Better Business Bureau for our customer service. We wish you a wonderful vacation! I booked a hotel reservation with bookvip. During the booking process they asked for my annual salary. I then found out it was a timeshare deal. But ok, I told them how much I'm make. They took the money from my account. The day I was to check in the hotel calls me and tells me I do not qualify due to my salary - it was too low. I called bookvip to request a refund and was told there would be a $150 penalty taken from my money because I did not cancel in 7 days of the booking. Even though they knew how much I made they made the reservation knowing I would not qualify and then keep my money. They have ruined my vacation. Now I do not have enough money to pay for a hotel. Thank you bookvip for being jerks. Oh, and do not ask for a supervisor, they are either in training or too busy to talk to you. I ask 3different times. This is the worst company to do busy with. Poor customer service (I think they are in India) bac use they speak very poor English. DO NOT DO BUSINESS. WITH THIS COMPANY? THEY WILL STEAL YOUR MONEY. I didn't like: Poor customer service, Put on long hold, Illegal practices. Review #661362 is a subjective opinion of User661362.